Fun, friendly and fabulous! Frogs are an important part of the Balinese culture, as their sounds are the natural music and rhythms of the rice paddies. 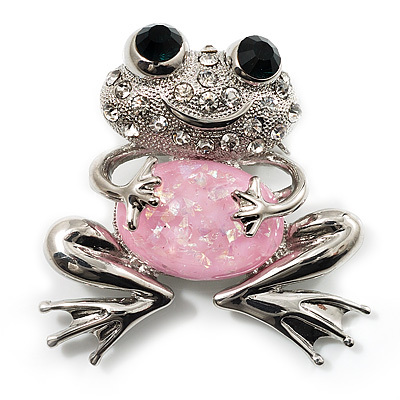 This cute smiling frog brooch is crafted in shiny rhodium plated metal and pave set with clear crystals. The body set with an oval pink coloured resin stone, and the eyes decorated with large emerald green stones for unique look. It measures about 4.5cm x 4.5cm and fastens with a flag pin and revolver clasp. This exquisite frog brooch will delight you and the people you meet along life's journey.